Heather's Perfect Posts: Especially for Mrs. Chalfin's class, Prefixes and Suffixes! Our reading/tech buddies are from Mrs. Chalfin's class, and they are in second grade. I noticed they were learning about base words, prefixes, and suffixes, but were having a bit of trouble. I thought I could make a blog post to help them. IMPORTANT: Every one of the words that has a prefix of suffix has to have a base word! Sometimes, you don't know what the prefix or suffix means. Some of the basics are -er, -ful, -ly, -ing, and un-. -er means someone who. For example, a farmer is someone who farms. A reader is someone who reads. -ful means full of. When you make a suffix, you get rid of one L in full. A hopeful person is a person who is full of hope. -ly is having the qualities of. One word that goes with it is friendly. -ing means being a sign of a verbal action, such as scouting. -un usually means not. Unlike means you are not like ______. Mrs. Yollis let me borrow some magnetic base words, prefixes, and suffixes to take a picture and build with them. I took the pile of words prefixes, and suffixes. Then I unscrambled them to make words. The left side is the prefixes, the middle is the base words, and the right side is the suffixes. Here is a picture of all of the words that were spellable (I made up the word spellable). As you may know, words like hop and stop you have to double the letter at the end of the word if you are going to add a suffix. The eleventh word on the picture is stoped. To make it correct, you would have to double the P, but I didn't have a extra P. Just keep in mind that you still have to double the P.
With some of the words, I could have added another suffix, such as overdo. Instead of overdo, I could have made it overdoing. Now, I have a Step-up-to-Writing paragraph that I want to share with you. It is going to include one topic sentence, three main ideas, and at least two details for each main idea, and one conclusion. Out of all the words that have prefixes and suffixes, I chose three to explain. One of my words is disagreement. I chose this word because it shows a prefix, base word, and a suffix. Dis- means not. It has almost the same meaning as un-. To agree to something means you share the same idea and think it is also correct. A synonym for that is concur. Ment- means forming nouns expressing the means or result of an action. Disagreement is a negative word. If you disagree with someone, you don't agree. Another of my words is reappear. To reappear is to appear again because re- means again. The base word for reappear is appear. If you take off the re- and replace it with dis- it will make disappear. An antonym for reappear is also disappear. Reappear can be a positive word if you make it one, but it can also be a negative word. If a bee stung you, and another bee reappeared, that would have been using it as a negative word. Finally, I want to share the word midnight with you. As you probably guessed, mid- means middle because the first syllable is spelled mid. Midnight isn't exactly the middle of night because after midnight, the next morning starts. The antonym for midnight would be noon. If you get rid of the mid- and replaced -fall at the end of the word, it would be nightfall. The meaning of that is that the night is beginning to rise and the evening is gradually mixing into the night. Clearly, everyone can have fun changing the prefix or suffix on any base word! I hope the blog post helped you! What are some prefixes or suffixes that you are learning in class? Can you come up with some words that have prefixes or suffixes? What is your favorite word that includes a prefix or a suffix? I was "overjoyed" when I read the blog that you wrote for our class. our class because they will be so "grateful" for your help! Thank you for inviting me to your class to share! I spent a lot of time into the blog post, and I am thankful for that you left me a comment! It was fun sharing my blog with your class, and I enjoyed teaching them how to comment. They seemed very concerned that they would know how to comment, so I was wondering, did you teach them to comment too? I am glad that it went so well with Mrs. Chalfin's second graders! You mentioned that the students were nervous about commenting, that is because they are novice bloggers, like you used to be. They will recall how blog. Remember how we took them to the computer lab and gave each student a one-on-one lesson? Plus, they know to work with a parent. That is rule number one. I am looking forward to seeing the comments! I am exceedingly proud of your new blog post. Not only is it well written, but it is a useful tool for students who are just learning about base words, prefixes, and suffixes! You are truly a terrific teacher! Tell me how the lesson went with Mrs. Chalfin's second graders? P.S. Did you find and prefixes and suffixes in my comment? Out of all of the grand things that happened in Mrs. Chalfin's class, I think three are the most important. First, I shared the caption above the picture with them. I told them that the "word" spellable wasn't really a word. I made it up to make a point. In that paragraph, I also used some prefix or suffix words like unscramble. Second, I taught them that you had to double the P like in stoped. Mrs. Chalfin said that they had learned this before, so it was like a review! I thought that it was interesting that there was one irregular verb in there, just waiting for me to spot it! Finally, I shared my Step-up-to-Writing paragraph. I show them the green topic sentence, yellow main ideas, red details, and green conclusion. I let them read the paragraph TO me, so that they could comprehend all of the words. While they were reading, I noticed that they had a system. The person who was reading would have two St. Patrick stuffed animals on their desk. Once one person was finished, they passed it on to another person. As you can see, I had a pleasant time with Mrs. Chalfin! Yes, I did find some prefixes and suffixes in your comment. For example, exceedingly is one. The other few are: useful, students, learning, words, prefixes, suffixes, truly, graders, loving, and teacher. I wasn't really sure if written has a prefix or suffix. Does it have a prefix or suffix? Wonderful job! I know other kids will really benefit from your blog post. Keep up the good work! I really enjoyed your blog. It is really good. Here are some of the prefixes that we are learning: un, dis, mid, pre, sub. Here are some suffixes that we are learning: ing, ness, er, ly, ful. Your blog is very HELPFUL. Help is the base word and ful is the suffix. I was wondering what are some of the prefixes that you are learning in your class? Thank you for the comment, Emili! We haven't been learning prefixes and suffixes in class so much, but we have learned, -ness, -ly, and -ful. That is all of the suffixes that we have recently this year, but last year, we learned all of the ones that you learned! Yes, you are correct. In helpful, help IS the base word and -ful IS the suffix. Good job! I am Sam in Mrs. Chalfin's class. Some prefixes that we are learning are: un, re, pre, dis, over, sub, mid, and mis. Here are some suffixes that we are learning in class: er, ing, s, less, ful, est, ed, able, and ment. 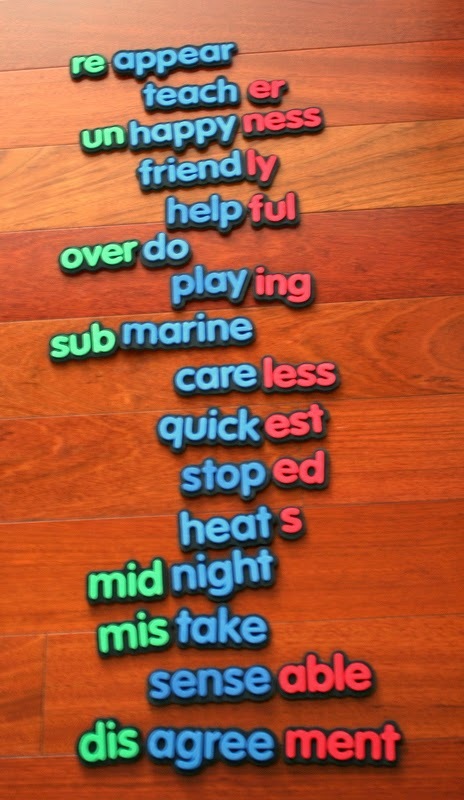 Some words with prefixes are: overnight, midnight, reteach, prekindergarten, submarine, and redo. Some words with suffixes are: swimming, jumping, helpful, hopeful, reader, writer, quickest, quietest, homeless, disagreement, camped, readable, and teachable. My favorite word that I came up with is reteaching because it has a prefix, a base word, and a suffix in it. Heather, thank you for coming in and teaching our class. You helped me learn about prefixes, base words, and suffixes. I liked when you told classmates to put marbles in the marble jar. I was wondering if class in classmates is a prefix, but my mom thinks classmates is a compound word. What do you think? Prefix: undo, remake, pretest, disorganize, misunderstood, and overdid. Suffix: farmer, starting, buys, useless, funniest, writable, zoomed, and playing. You asked me what I think classmates is, a suffix or a compound. I actually agree with your mom that it is a compound because mates is a base word, not a suffix. Class is a base word too. As you probably know, two words combined together makes a compound word. I am going to quiz you, is baseball a compound, or a prefix suffix word? I really enjoyed reading your blog! I learned a lot about prefixes and suffixes. Your blog is very helpful! 2. Some words that have prefixes or suffixes are chewing, retaking, and blogging. 3. My favorite word with a prefix or a suffix is blogging because I am doing it right now. This is my first time blogging and I love it!!! Why did you decode to put up this blog for our class? I decided post this post because for grammar homework, we could either choose Webby Wednesday, or paper homework. I thought Webby Wednesday would be more interesting. Then, while we were all working on our mystery picture, Mrs. Yollis called me over. She said that you were learning about prefixes and suffixes. Mrs. Yollis said that I could probably type a post just for you to help you learn. I thought that was a perfect idea, so I did it! hello my name is Kayla from mrs. Chalfin's class. I love how you wrote in different colors. you seem to be a very smart student. Do you like having a blog? We are learning alot about prefixs and suffixs. Your grammar post has helped my students immensely! We all thank you for your time and expertise! I bet that the post helped clarify prefixes and suffixes for you, too! Often times when we teach, we deepen our own learning. I noticed that you are leaving challenges for my students, so here are a few for you! Compound Word or Base Word With a Prefix/Suffix? Thank you, again, for your priceless post! Your post on prefixes and suffixes is brilliant. I love what you have prepared to help younger children. This means you are not just a student, you are a teacher to younger children. Being able to share knowledge is a gift valuable to both the giver and receiver. I left you a comment this morning, but I don't see it on your post. Can you check your dashboard to see if you have a comment in there that is mine? If I were in second grade I’d be amazed by how much you taught us. Although I am in third grade, I still think it was very helpful. I noticed that stopped was misspelled, so I am glad that you pointed it out. Good job noticing that there was a double P in stopped. I think the easiest word you created on the page is heats. Just adding the S made a new word. When you said spellable for a second I thought it was a real word, but luckily you clarified it. Spellable could mean your word is able to be spelled. Did you notice that I bolded all of the prefixes and suffixes? Misspelled has a prefix and a suffix. Are there other words that have both prefixes and suffixes that you can think of? Wow! You have a lot of words that include prefixes and/or suffixes! Yes, I did notice that you bolded all of the prefixes and suffixes. That must have taken a long time! Insincerely has a prefix and a suffix too. In- is its prefix and -ly is its suffix. Do you think that I am correct?